Are you looking to broadcast your business to the world? Are do you want to make your business a global business? Well, then it is best that you make use of the Internet platform. Yes, the Internet is one place where you will be able to target your audience better. You can target audience belonging to all age groups. Doing online business and also online branding can help you run your business more smoothly than the normal traditional marketing format. 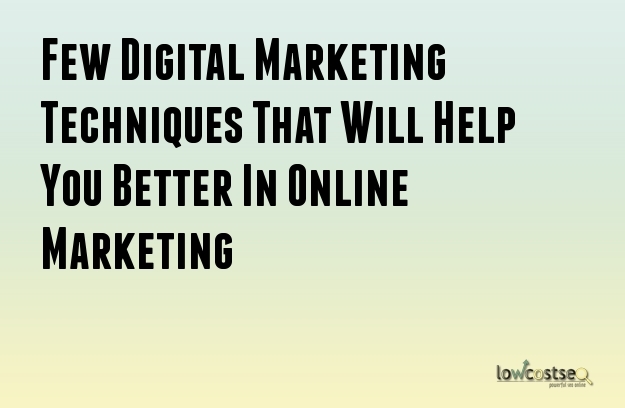 There are various techniques that you will have to make use of in order to have a successful online marketing campaign. Day by day new technologies and techniques are taking over the old ones. This is the reason why it is important that you also keep yourself updated in order to survive the competition against your rivals. So, what are the new digital marketing trends that you should make use of in order to do a successful online marketing campaign? Well, here is a list of those things that can help you do a successful marketing campaign online. Most of the people are not aware of the right technique of doing guest blogging. Day by day, the Google search engine is updating its algorithms for which most of the guest blogs are getting penalized as Google is considering them to be spam. Thus, in order to have effective guest blogging it is important that you plan an effective blogging strategy. You will have to make sure that you write your blogs keeping in mind your readers and not just for the links. Believe in quality blog writing and not quantity blog writing. There was a time when if you had to improve the ranking of your website and make your content visible to the targeted audience you had use of effective search engine optimization strategy. However, these days the story is completely different. Nowadays, for a better website ranking it is important that you make use of social networking sites. Make sure that you use engaging contents and share on various social networking sites or social media. Do install social sharing buttons on the website that you have created. Preparing and installing presentations is one way of attracting the attention of your targeted audience. It has been seen that companies that put forward their opinion in presentation format get much better viewership. This is the reason why it is important and necessary that you include presentations in your digital marketing strategy. Create unique and attractive presentations with the help of Sway, Prezi, and also PowerPoint. If you are looking to build your brand identity it is important that you do it by expressing it in the form of a story. So, if you really want to make your brand presence in the virtual world it is important that you prepare a story to tell your targeted audience. Make use of visual storytelling as that will help you to draw the attention of your customers to a great extent.